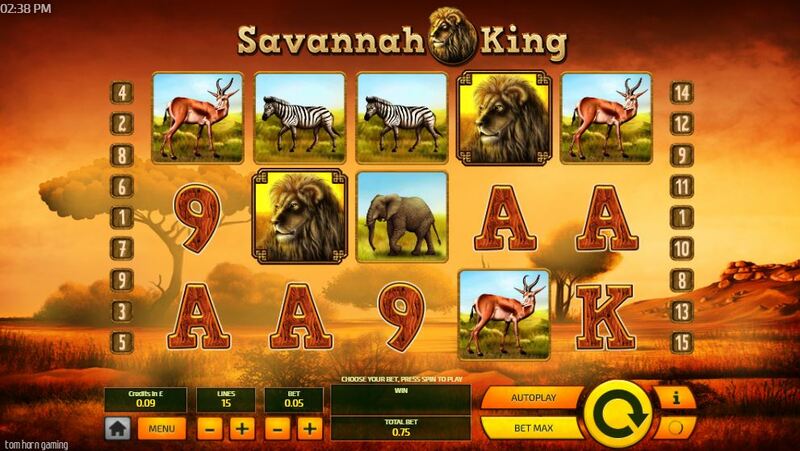 Tom Horn are taking us on an African Safari adventure, but no need to pack your bags as they are bringing the plains of the Sahara to you, in this online casino game Savannah King slot. The game features 5 reels and 15 pay lines and will take you on the adventure of a lifetime. You can play this mobile slot for real cash now at easyslots.com. 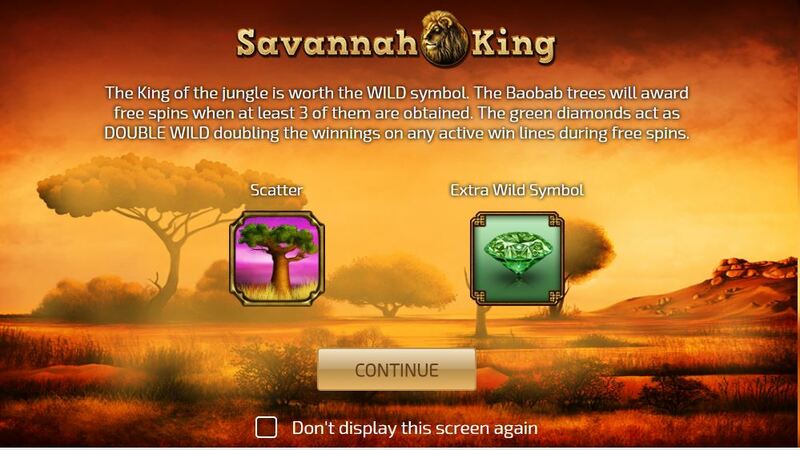 The wild symbol in this online slot game is represented by the Lion symbol and this wild will substitute all symbols on the reels except for the scatter symbol. The wild symbol will also trigger an exciting free spins feature. In the free spins feature scatter wins are multiplied by total bet and in this game, sadly, free spins cannot be retriggered. Extra wild symbol (green diamond) will appear only in the free spins feature. It will appear in the 2,3 and 4th reels only and substitutes all symbols except scatter and wild. Wins with this extra wild will be doubled. The scatter symbol is the Baobab tree and 5 of these on the reels activate 10 spins and 5x multiplier. 4 baobab trees trigger 10 free spins and 3x multiplier, 3 is 10 free spins and 2x multiplier.